If you follow along with us you know I am a HUGE fan of bite-sized and mini-sized snacks and treats! I love grab-and-go and there’s just something about mini sized things that makes them taste better I swear! 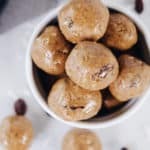 These pecan date energy bites are no exception! What’s better than a tasty little bite? 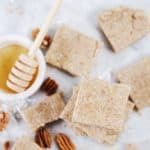 Well, a tasty bite that is super simple to make and only has 5 ingredients! That’s what! 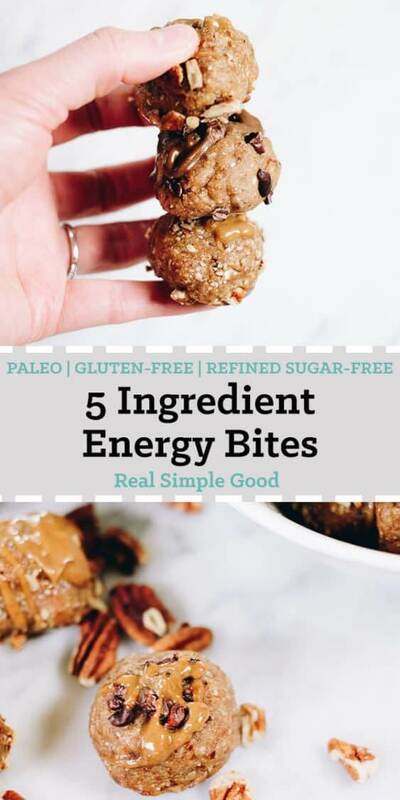 You will recognize and probably have on hand all 5 of the ingredients if you have a pretty well stocked Paleo pantry, too. We are SUPER lucky to live in the same town as the folks over at Jem Organics, and we get to enjoy all their glorious nut butters often! 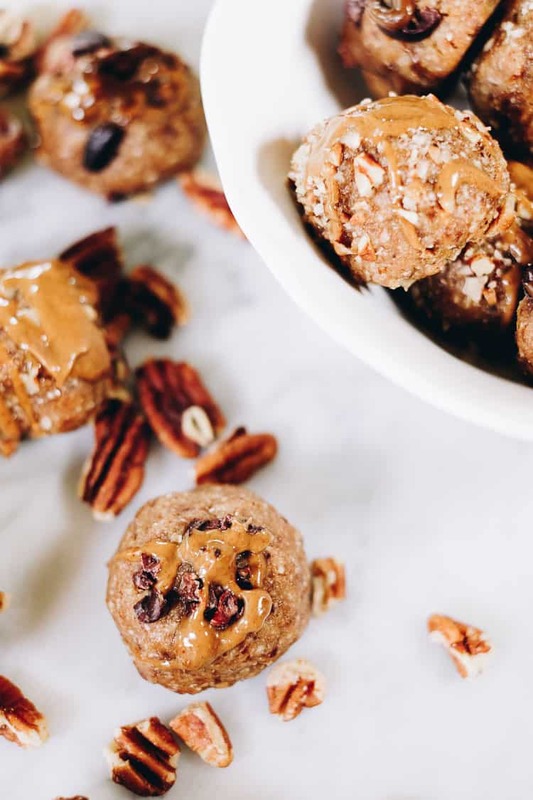 I made these tasty pecan date energy bites with regular unflavored almond butter in the balls themselves, but then topped them with Jem, and oh man – best decision ever! These little bites are pretty much all I’d crave! Get your hands on Jem Organics nut butter and thank us later! 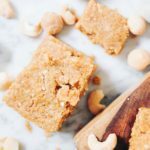 My favorite flavor in their regular roundup is either cashew cardamom or cinnamon maca. Justin loves the superberry flavor. The raw cacao nibs (and 5th ingredient) are optional. I like the little crunch they add. 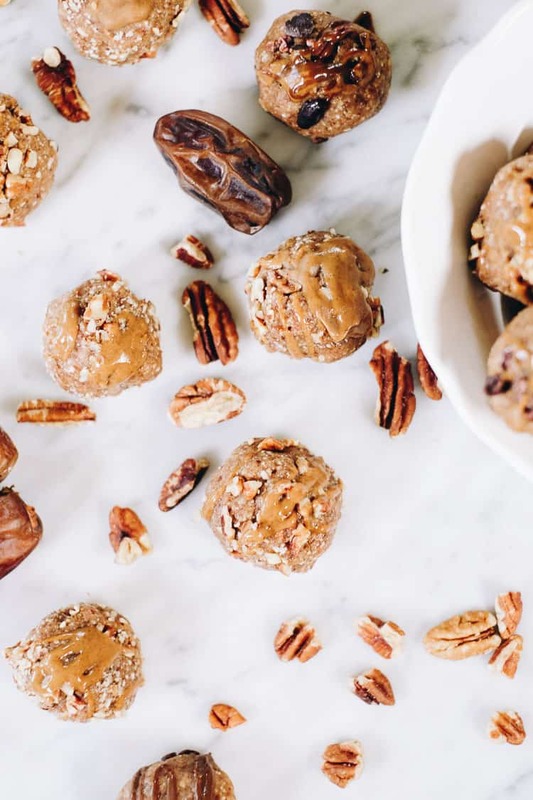 All you need is a food processor to bring these pecan date energy bites to life. You just combine all of the ingredients in your processor and let it go until the mixture balls up. You might have to stop and scrape the sides down a couple times, but that’s it! I like to line a baking sheet with parchment paper and roll the balls out and set them on the baking sheet. Then, I roll some in cacao nibs, some in chopped pecans and drizzle with Jem nut butter. Ta-da! Move them to the freezer and let them set. 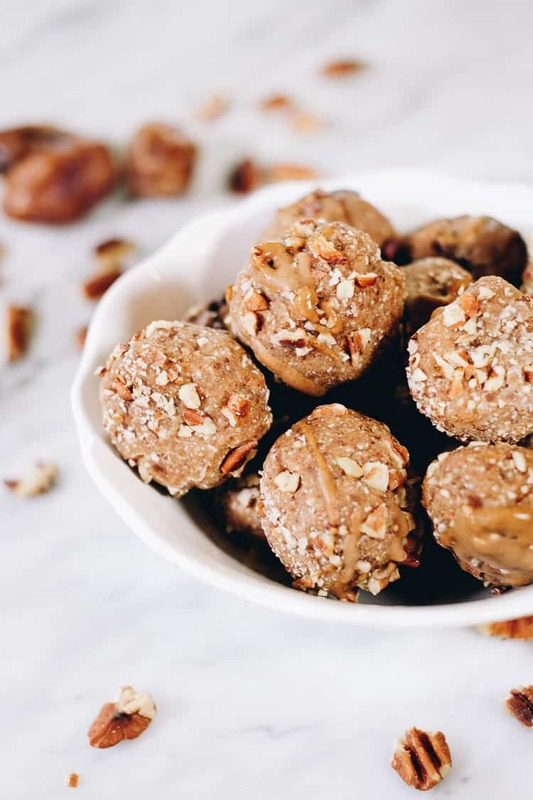 You will love the flavor, texture and how easily these pecan date energy bites come together. 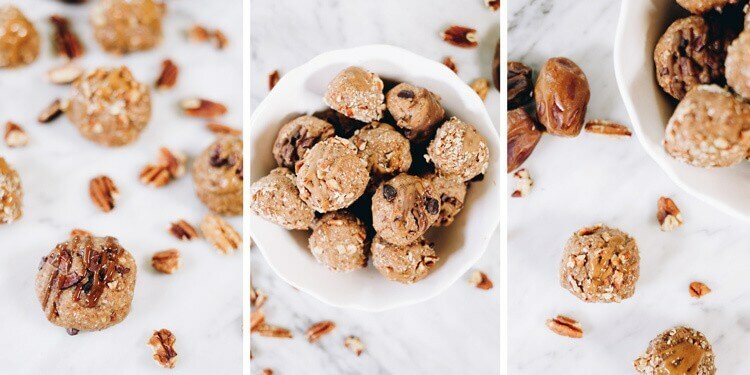 Go ahead and add these pecan date energy bites to your meal prep plans. 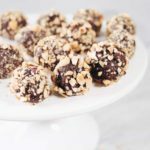 You’ll love having these tasty little bites on hand for when you need a snack, afternoon pick-me-up or just something to take with you out the door. Let us know how it goes by leaving a comment below. Also, take a photo and tag us on Instagram @realsimplegood, so we can check it out! What's better than a tasty little bite? 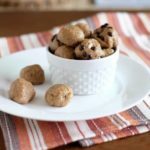 Well, a tasty bite that is super simple to make and only has 5 ingredients! 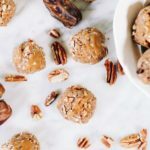 You will recognize and probably have on hand all 5 of the ingredients for these Pecan Date Energy Bites if you have a pretty well stocked Paleo pantry! Place the pecans, coconut, almond butter and dates to a food processor. Process until ingredients are combined and a ball starts to form in the processor. You may have to stop and scrape the sides down a couple times. Once ingredients are combined, stop processor and remove the blade. Line a baking sheet with parchment or wax paper. Roll mixture into balls and place on lined baking sheet. 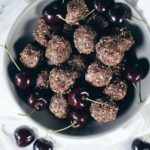 Roll in cacao nibs if you are using them, and drizzle with more almond butter over all the balls. Place in the fridge or freezer to set. Once set remove and store in an airtight container in the fridge. Enjoy!